"An excellent book on the therapeutic potential of ayahuasca; clearly written and well researched, it is an important addition to the literature on the subject." "Rachel Harris brings . . . the perspective of an astute observer, the rigor of a scientist, the compassion of a therapist, and the insight that only a participant can offer. 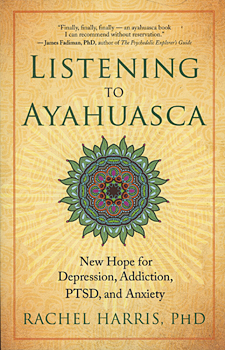 Anyone contemplating an ayahuasca experience, or who counsels such a person, would be well advised to first consult this profound and important book." "Rachel Harris has produced a uniquely brave study of ayahuasca use and users, through the experiences of others and, most significantly, her own explorations. She never dodges the big questions (Who or what is the guiding intelligence experienced?) or comes up with static answers. Instead, she moves through the mysterious process of self-encounter, sharing a string of hard-won insights into how ayahuasca can work its magic to relieve human suffering." "Rachel Harris delivers a refreshingly honest, balanced account of the complex literature concerning ayahuasca, discussing potential risks alongside purported benefits and allowing room for the sometimes extraordinary and mysterious experiences reported by initiates. At once accessible and well informed, this work represents a much-needed guidepost for health professionals who may encounter ayahuasca users in their practice, as well as for spiritual seekers with an interest in entheogens." -- Albert Garcia-Romeu, PhD, Behavioral Pharmacology Research Unit, Johns Hopkins University School of Medicine.